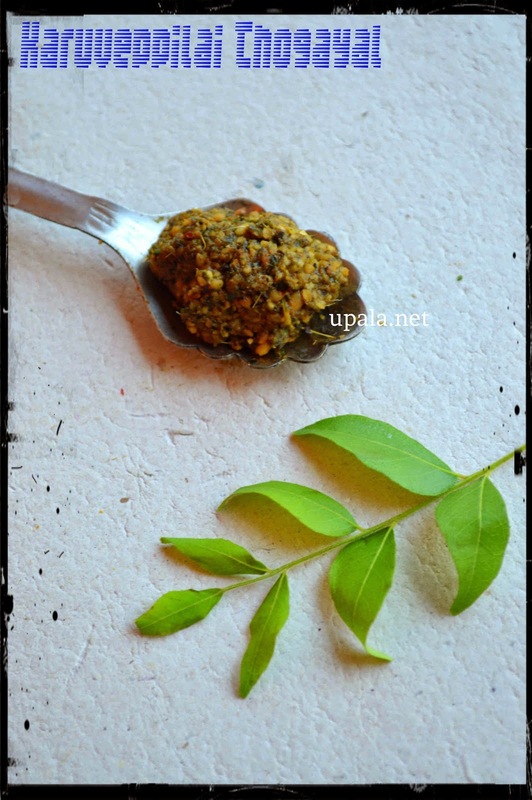 If you don't get pirandai, you can skip it and grind the thogayal with rest of the ingredients. In this case add 4 cups curry leaves. 1) Choose the tender stem and scrap off the angular edges and node. Apply sesame oil in hands before handling pirandai to avoid itchiness. 1) Heat a kadai, add 1/2 tsp oil and roast pirandai in low flame till it gets cooked. And transfer it to a plate to cool down. 2) Add curry leaves to same kadai and dry roast for 10 mins in low flame and transfer. 4) Sauté Asfoetida, Red chilli, pepper and tamarind for few secs. Transfer it to the same plate to cool down. 6) Now sauté Urad dal till golden brown. 7)First, grind Asafotida, Redchilli, Pepper, Tamarind, Salt & jaggery next add Urad dal to the mixer and grind. Finally add Curry leaves & Pirandai with water and grind. 1) Instead of thogayal, you can grind it as dry powder with out adding water. This dry powder can be strored in airtight container. You can either consume it as powder by adding to rice or add few hot water and grind it once in mixer for ready made thogayal.